1. Mina Marilda Baker b 5 Apr 1878 Deane, Letcher Co KY d 21 Feb 1924 Deane, Letcher Co KY; buried Bentley Cemetery, Deane, Letcher Co KY; m. 14 Jan 1898 Deane, Letcher Co KY to John Lacy Bentley b 18 Feb 1868 Letcher Co KY d 24 Dec 1966 Dean, Letcher Co KY; buried Bentley Cemetery, Deane, Letcher Co KY; s/o John Quiller Bentley and Lucinda Thacker. 2. Thaddeus Lowry Baker b 13 Oct 1880 Millstone, Letcher Co KY d 15 May 1964 Beaver Dam, Letcher Co KY; m. 4 Feb 1902 Beaverdam, Letcher Co KY to Rawsey Sergent b 5 Oct 1880 Democrat, Letcher Co KY d 1 Nov 1917 Beaver Dam, Letcher Co KY; d/o David Andrew Sergent and Nancy Jane Bagwell. 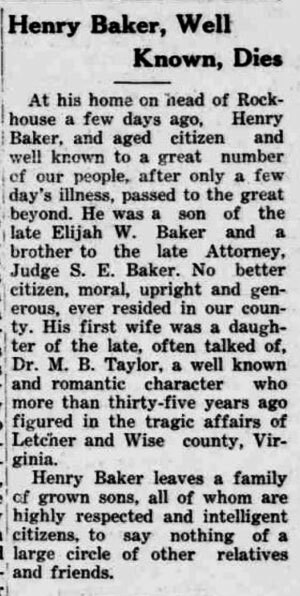 Thaddeus Lowery Baker m. abt 1922 Letcher Co KY to Ettie Hill b 15 Apr 1893 d 15 Aug 1956; d/o Samuel Hill and Jane Gabbard. 3. Ira Tillman Baker b 31 Jan 1883 Colson, Letcher Co KY d 20 Mar 1965 Jackson Co OH; m. 20 Mar 1903 Letcher Co KY to Susan Moore b abt 1883 KY. Children of Ira Tillman Baker and Susan Moore; i. Fred Baker b 1910 KY ii. Edna Baker b 1912 KY iii. Coleman Baker b abt 1918. 4. Sherman Howard Baker b 22 Aug 1885 Colson, Letcher Co KY d 2 Dec 1966 Whitesburg, Letcher Co KY; buried Baker Cemetery, Colson, Letcher Co KY; m. 10 Sept 1904 Letcher Co KY to Manerva Sergent b 1 Oct 1887 Democrat, Letcher Co KY d 1 Sept 1971 Whitesburg, Letcher Co KY; buried Baker Cemetery, Beaverdam, KY; d/o David Andrew Sergent and Nancy Jane Bagwell. 5. Willard Calvin Baker b 20 Oct 1889 Deane, Letcher Co KY d 7 Mar 1976 Stanford, Lincoln Co KY; m. 29 Feb 1912 to Julia Sergent b 17 Aug 1890 d 3 Dec 1981 Stanford, Lincoln Co KY; d/o David Andrew Sergent and Nancy Jane Bagwell. 6. Anabel Catherine Baker b 26 May 1892 Beaver Dam, Letcher Co KY d 24 Dec 1913 Beaver Dam, Letcher Co KY; m. 31 Dec 1911 to Robert Humphrey Amburgey b 11 May 1888 Carr Creek, Knott Co KY d 20 Jul 1962; s/o Alfred Amburgey and Elizabeth Amburgey. Robert Humphrey Amburgey m. (2) to Gertrude Quillen b 1898 KY d 27 Mar 1997 Nashville, Davidson Co TN; d/o Richard Quillen and Carrie Venters. 7. Sylvan Carey Baker b 4 Sept 1894 Deane, Letcher Co KY d 10 Aug 1941 Jenkins, Letcher Co KY; m. abt 1918 Letcher Co KY to May Hunley Vance b 20 Sept 1892 d 5 Apr 1975 Letcher Co KY; buried Baker Cemetery, Colson, Letcher Co KY; d/o Ambrose Hunley and Rachel Gibson. Henry Baker b 26 Feb 1858 Letcher Co KY d Sept 1929 Letcher Co KY; buried Baker Cemetery, Colson, Letcher Co KY; s/o Elijah Willis Baker and Mary S Polly Yonts. 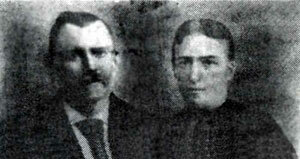 Henry Baker m. Lydia Angeline Parsons b 11 Jul 1854 Letcher Co KY; d/o David Parsons and Derinda Emeline Privett. Henry Baker b 26 Feb 1858 Letcher Co KY d Sept 1929 Letcher Co KY; buried Baker Cemetery, Colson, Letcher Co KY; s/o Elijah Willis Baker and Mary S Polly Yonts. Henry Baker m. about 1900 Letcher Co KY to Martha Ann Clay b 10 Jun 1861 Letcher Co KY; d/o Elijah Green Clay and Susan N Sergent. Martha Ann Clay m. John L moore b 3 Apr 1859 Letcher Co KY d 16 Mar 1936 Owsley Co KY; s/o Madison Moore and Susannah Estepp. John L Moore m. 1891 KY to Emily Moore b 28 Feb 1873 KY d 11 May 1954 Hamilton, Butler Co OH.